Our DialzipTM dialup network is compatible with all Windows operatings systems. Windows 95, 98 and ME have almost an identical setup. To setup your account properly you should be familiar with the dialup protocols of your operating system. 1.) Click on the Start button, point to Programs, point to Accessories, and Click on Dial-Up Networking. 2.) In the Dial-Up Networking window, double-click on the Make New Connection icon to start the Make New Connection wizard. 3.) Type in "WEBCS DIALZIP ACCESS" for the Computer You Are Dialing. Make sure the correct Modem type is selected, and click on the next button. 4.) Enter the local access number provided by WEBster Computing Services in the Area Code and Telephone Number text boxes. 5.) Then click on the Next button. In the final wizard dialog box, click on the Finish button to close the wizard and create the new connection. 6.) Now that you've created the connection, you need to give it more information About your Internet Service Provider. The Dial-Up Networking window will include a new icon for the connection to the WEBCS DIALZIP NET, which you just created. 7.) Right-click on the new icon to display a context menu, and choose Properties. 8.) The dialog box that appears will contain the phone number and modem information you already entered. Click on the Server Type button. 9.) 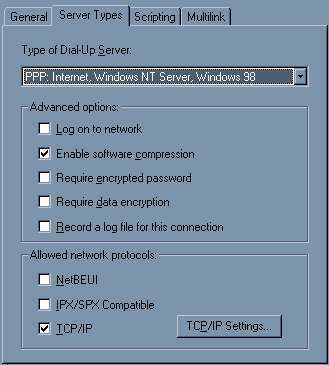 At the top of the Server Types dialog box, make sure the default setting of PPP: Windows 95 (or Windows 98 when appropriate), Windows NT 3.5, Internet is selected. 10.) Mark the Enable Software Compression check box, and clear the other two check boxes under Advanced Options. 12.) 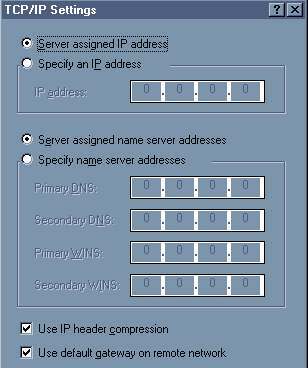 Check the Server Assigned IP Address option button because your ISP Dynamically assigns your IP address (in other words, do not specify an IP address). Similarly, check the server assigned name server address button (in other words, do not specify DNS servers). Note: if your modem or router absolutely requires DNS servers we can get them for you in most cases. 13.) Finally, to confirm that Windows will use the new connection automatically, Double-click on My Computer icon on the Windows desktop, double-click on Control Panel, and then double-click on the Internet Icon. Make sure that the Use Auto Dial check box is marked and that your new connection is selected under Settings. Then click on OK. Congratulation, your set-up is complete. 14.) To create a shortcut icon on the Windows desktop, you simply double-click on The My Computer Icon, and then double click on the Dial-Up Networking icon. Right drag the icon for your Internet connection onto the desktop and choose Create Shortcut(s) Here from the context menu. 15.) Clicking on this shortcut should allow you to automatically logon. Please note, with some Windows 95 versions a text command box may appear after logon is complete. Click F7 if this occurs to complete your connection. Note: if you are using ISDN we suggest using multi-link and disabling any bandwidth on demand feature.